Lee, also known as Lee Green, is a district of south east London, within the London Boroughs of Lewisham and Greenwich. It is located west of Eltham and east of Lewisham town centre. The district is in the historic county of Kent. 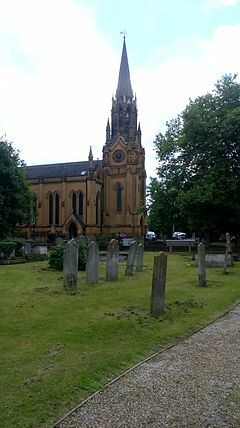 St Margaret's Church (built 1839–41, architect: John Brown) is the burial place of three Astronomers Royal: Edmond Halley, Nathaniel Bliss and John Pond. A map showing the Lee wards of Lewisham Metropolitan Borough as they appeared in 1916. The Manor of Lee was a historic parish of the Blackheath hundred and existed up to 1900 when it was merged with the parish of Lewisham to create the Metropolitan Borough of Lewisham. While modern Lee is centred on Lee railway station and the road of Burnt Ash Hill, the parish was based around Lee High Road which today stretches into the town centre of Lewisham. The River Quaggy formed much of the boundary between the two parishes, though at Lee Bridge (at the western end of Lee High Road) it is now almost completely hidden. The Lee Manor Society have produced a comprehensive history of the area. The Domesday Book describes Lee as a small area of cultivation set in extensive woodland. The earliest map available (Rocque's of 1740) shows a cluster of about a dozen houses around a triangular village green. This hamlet was surrounded by fields. Lee Green Farm occupied the south-east quadrant from the 1660s (roughly on the site of the present Leegate shopping centre). The farm was demolished in the 1840s and rebuilt as Tudor House further east. The place where Robert Cocking in 1837 died in the first parachute accident ever, is part of Lee. The Old Tigers Head and the New Tigers Head pubs are important and striking features of the crossroads. Confusingly, the original (Old) Tiger's Head is thought to have been built on the site currently occupied by the New Tiger's Head. The original pub is thought to have been built before 1730. It was rebuilt on its present site, the north-west quadrant, in 1750–1770 and then rebuilt (in its third incarnation) in 1896 – the date carried on its frontage. It became an important mail and coaching inn. The New Tigers Head started life as a beer shop known as the Tiger Tavern in the 1830s. It was situated in the end of four cottages known as Prospect Terrace built around the same time. Three of these cottages remain, housing a post office/newsagent and a hairdresser. In 1868 it is referred to as the Tiger's Head Inn. The present building is thought to have replaced the original cottage a few years after 1896 – the date of the rebuilding of the Old Tigers Head. The New Tigers Head has now closed down. In the early nineteenth century boxing matches took place at the Old Tiger's Head. Horse racing and (human) foot racing took place in the 1840s but the police put a stop to these events, probably under pressure from local citizens. At that time the green was the centre of village life with cricket matches, bare knuckle boxing and other entertainments. In the 1850s further house-building prompted the installation of proper sewers and the Lee Green horse pond was filled in. In the 1860s John Pound, a developer, erected houses in the south-east quadrant, Orchard Terrace on Eltham Road and Crown Terrace on Burnt Ash Lane (now Road). The opening of Lee station in 1866 prompted more house-building at the crossroads. The site of Lee Green Farm was built on as Carston Mews. In the same year Charles Henry Reed, a linen draper, moves into 1 Orchard Terrace and established a department store. Reed died in 1895 and in 1903 the business was taken over by Griffith & Co. In the south-west quadrant the Prince Arthur pub was built at 422 Lee High Road in 1870 (closed 2005). It was originally one of a row of early nineteenth century cottages of which three – nos 424–428 – survived behind modern shop fronts. In 1898 No 345 Lee High Road was built in front of the former Old Tiger's Head stables. It incorporated a fire station but the London County Council built a replacement in 1906 in Eltham Road. It is still in use. A police station was built at 418 Lee High Road in 1904, replacing one built before 1860. It was converted to apartments in 2003. In the early 1960s the south-east quadrant, including Carston Mews, was demolished to make way for Leegate shopping centre which went into decline following the opening of Sainsbury's on the opposite side of Burnt Ash Road in the late 1980s. Owners of the centre, St. Modwen Properties have recently proposed a £40m regeneration plan for the centre, including the demolition of the current shopping precinct to be replaced with an Asda supermarket as well as the conversion of the existing office block into a hotel. Sir Francis Baring, founder of Baring Brothers Bank, bought the Manor House (attributed to architect Richard Jupp) in Manor Lane (now a library and its grounds a public park, Manor House Gardens) in 1796. Henry Thomas Buckle, English historian and author of A History of Civilization was born in Lee. Poet Ernest Dowson was also born in Lee. Actor James Robertson Justice was born in Lee in 1907. Musician Manfred Mann lived in Southbrook Road in Lee. Sir Gregory Page built a large mansion house (demolished in 1787) at Wricklemarsh in Lee. Mechanical engineer John Penn died at his home, The Cedars, Lee on 23 September 1878, and was subsequently buried at nearby St Margaret's Church. Reggie Schwarz, South African cricketer, was born in Lee. Stanley Unwin, publisher, lived in Handen Road. Estelle Winwood, English stage and screen actress who later lived in the USA and, at the time of her death at 101, she was the oldest member in the history of the Screen Actors Guild. Lee High Road is the major road through the area and forms part of the A20 road. Lee railway station serves the area with services to London Charing Cross, London Cannon Street both via Lewisham and via Sidcup and Woolwich Arsenal as part of a loop service. There are also services to Gravesend. Lee is served by many Transport for London buses linking it with areas including Bromley, Blackheath, Catford, Crystal Palace, Eltham, Kidbrooke, Lewisham, New Cross, Sidcup, Sydenham and Woolwich. ^ "Lewisham Ward population 2011". Neighbourhood Statistics. Office for National Statistics. http://www.neighbourhood.statistics.gov.uk/dissemination/LeadKeyFigures.do?a=7&b=13688954&c=Lee+Green&d=14&e=62&g=6333467&i=1001x1003x1032x1004&o=362&m=0&r=1&s=1476371923438&enc=1. Retrieved 13 October 2016. ^ Chandler, Mark. "St Modwen's £40m plans for the Leegate Shopping Centre feature Asda supermarket". News Shopper. http://www.newsshopper.co.uk/news/top_stories/9609789.__40m_revamp_for__black_hole__shopping_centre/. Retrieved 18 July 2012. This page uses content from the English language Wikipedia. The original content was at Lee, London. The list of authors can be seen in the page history. As with this Familypedia wiki, the content of Wikipedia is available under the Creative Commons License.